12″ x 12″ stencil print. House paint & colour pencil on corrugated card. David Cox has been making his constructed and painted artworks for over thirty years, hugely influenced by the music he loves, primarily Jamaican Reggae, Ska and Dub. In the beginning David was primarily using wood to construct with but in the early 90’s he started to give workshops in schools and had to rethink materials to make it easier to facilitate working with children. After experimenting, David found corrugated cardboard to be a perfect material to work with as it is light, it can be made very strong with reinforcement from withy and bamboo sticks, it is readily available, and free. 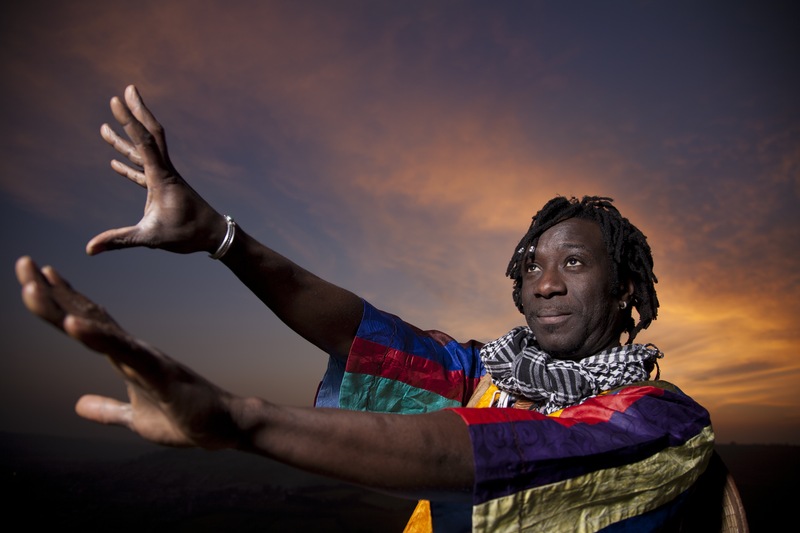 David’s workshops in schools led him to working with WOMAD ( World of Music and Dance ) Festival. David has run workshops for children all over the world at various WOMAD Festivals and was invited to be ‘artist in residence’ in 2001 making artwork for posters and publicity as well as parade art, stage design and a CD cover. 24 x 30 x 4 inches. 3d construction. Corrugated card, wood, greyboard, newsprint. house paint & colour pencil. 7′ x 7′ x 6′ Corrugated card, bamboo sticks and house paint. 30″ x 30″ x 3″ 3d construction. Corrugated card, house paint & colour pencil. The artworks are made from cut up corrugated card boxes, brown paper, sticks and found materials. Ecos Organic Paints, pencils and crayons on surfaces. The animation I make reflects the way my pieces are constructed, it is not bendy like plasticine, that you can make flow. My pieces are rhythmic I look on my animations as being like Dubs. I use stencils on cardboard, moving the pieces to produce stop frame animation loops which I then edit together. See more animation on DAVID COX YouTube Channel. Having dropped out of Art college, David Cox began making furniture and toys in the early 1970’s. In 1979, Southern Arts awarded him a ‘time off’ bursary, to make a body of work, which was shown at his first solo exhibition, at The Festival Gallery, Bath, in 1980. Since then he has exhibited widely in the UK and abroad, in both group and solo exhibitions. He has been ‘artist in residence’, at The Crafts Council Gallery, with the ‘Crafts In Performance’ show, as well as other galleries, arts centres, colleges, schools and a prison. Having worked as workshop leader with WOMAD in the UK and abroad, he was invited to be ‘artist in residence’, with the organisation, in 2001. During this time, he made work for posters, publicity, parade art, stage design and a cd cover. He has also worked extensively within education, including a year long residency at Harwell School, in Oxfordshire. From 1996 – 2001, he was principal tutor on the ‘Idea To Image’ module, in the Illustration Department, at UWE, Bristol. This entry was posted in Animation, Art, Ligeey, music, video and tagged abum, Amadou Diagne, Animation, Art, Cardboard, David Cox, Design, Dub, Ligeey, music, Reggae, Ska music, video, WOMAD.